The simplest form of distillation. 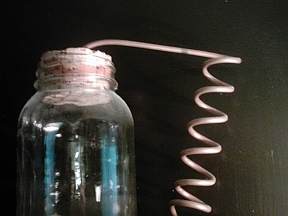 A mason jar with a large cork and a thin copper pipe used for the condensor coil. This little unit is sold at Edmund Scientific for around 30US but can be made for only 5 bucks. The exact type of copper pipe is hard to find at hardware stores. It's thin, but has thick walls so the hollow center is thin like the graphite in a pencil. This compresses the steam so you don't need to cool the coil. The jar is simply placed in a pan of water to heat it without breaking the fragile Mason Jar glass. Yes the glass is thick, but it's not borosilcate so it will break with too much heat in one spot. And of course, acids can't be distilled with this unit, but alcohol can, which is why it's good for beginners who don't have enough money for a professional setup. 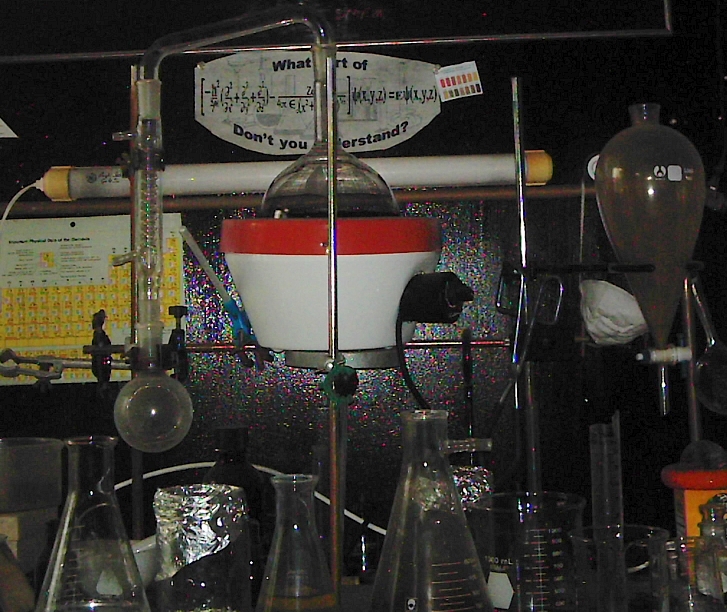 Here is another distillation setup. This one uses a flask which has a side arm permanently attached. A graham condenser cools the steam in a glass coil which is bathed continuously with recirculating cold water. A simple portable stove hotplate was used for the heat source. 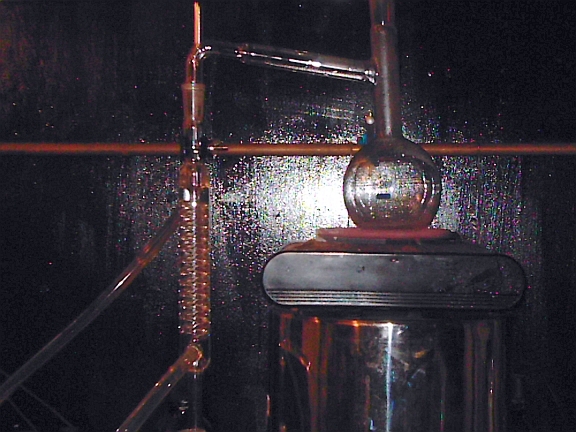 This distillation setup uses a 2 liter flask in a heating mantle specifically designed for the 2 liter flask size. A small 250ml receiver flask is attached to the condenser at the other end. Everything has glass ground joints so it can be sealed up when distilling something of an offensive or penetrating odor, or when distilling acids. A ventilation hose will need to be attached to the receiver flask to vent gases. Or an extremely large receiver flask can be used but the distillation will go much slower with everything sealed up, and the temperature must be kept low. Here is a close-up of the distillation arm. This can be arranged in 2 ways. 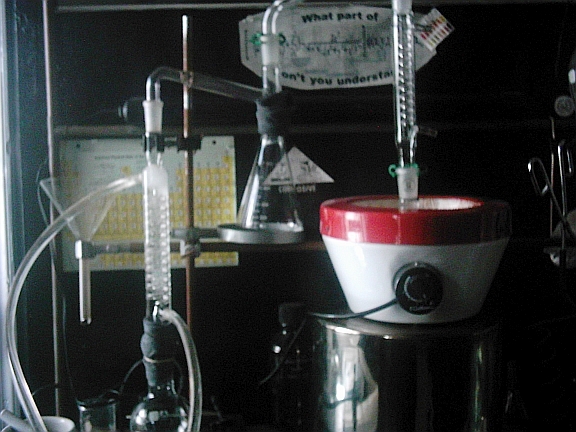 When it's angled down toward the distillation flask, less impurities will make it over to the condenser. But when it's reversed like in the above distillation setup, it's angled down to the condenser and more impurities will drip down into the receiver flask. This makes it act more like a retort of the old alchemists. When making the Philosophical Mercury, it's best to have it angled down towards the condenser since the acetonal oils condense in the arm and need to flow downward. 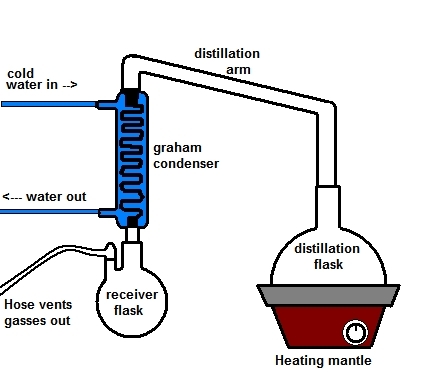 Here is a diagram of the distillation setup. Cold water is circulated through the condenser and bathes the coil in water. If acids are being distilled, they will condense into a liquid in the receiver flask to be reused a few more times. But since the acid produces such terrible corrosive fumes, gasses need to vent outside using tubing that resists acid attack. A normal rubber hose can't be used in this case. In fact, the only use for normal rubber is with the hoses connected to the condenser. A simple $10 fountain pump can recirculate the ice water through the condenser. The venting hose can also be submerged in a solution of very strong lye water which will neutralize the acid vapors, but it must be removed when the heat is turned off, or else water will siphon up the hose into the receiver flask. This happens because the air contracts as it cools, which creates suction. 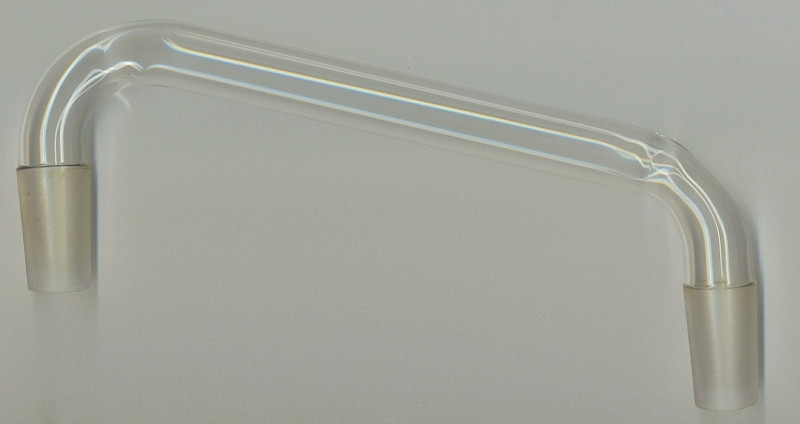 This is an attachment for a flask with ground glass joint. 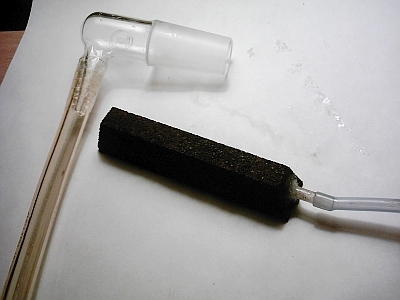 The tube connects to an air stone for fish aquariums. (not all air stones will work; some are too porous). It's used to collect the gases emitted when wine and vinegar are heated together. A salt forms on the air stone which is very medicinal. While it would appear to modern alchemists that the alcohol and acetic acid vapors must be the cause for this salt formation, that is not the case. I only did this to prove that it doesn't work. There is an article in the Essentia journal or Parachemy a man shows a drawing of an elaborate distillations set up like the one show above and claims that an acetone can be obtained which boils in the palm of your hand and dissolves gold. Pure nonsense lies of course; he just took a reference from 1 alchemy book about the Philosophical Mercury boiling in the palm of your hand and then claimed it could be obtained from the acetate process. What's funny is that he only had a drawing of his distillation set up and then demanded everyone else needs to get to work on real lab alchemy and quit being so lazy.